In paying tribute to DC's 75 year history, IADW will be going behind four of the best DC fan-sites on the internet, to find out about the passions, dedication, and people behind them. First up; Steve Younis, the Australian 'Man of Steel' behind the Superman Homepage. 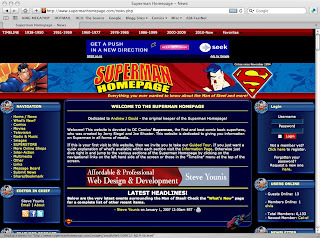 IADW: Running a website like the Superman Homepage takes loads of passion. What is the defining moment where Superman became yours? Steve: Seeing "Superman: The Movie" as an 8 year old. That was the moment I became a Superman fan as a child. It instilled a sense of wonder and excitement in me that has never died. IADW: Writer Mark Waid also stated that seeing the Superman movie changed his life, and even one of my first Superman comics contains a letter where a policeman tells DC, Superman is the reason he entered the police-force. Stories like these are endless. What is it specifically about Superman that you feel leads to him being so inspirational and motivational to those of us in the 'real world'? Steve: I've said it many times... To me, Superman's appeal is simple. He does the right thing simply because it's the right thing to do. That's a powerful thing. He has no ulterior motives. He's not out for revenge or vengeance. He doesn't do it out of guilt or for power. He's using the gifts he has to help other people because that's what he believes is the right thing to do. We may not have super powers ourselves, but we each have God-given gifts that we should use to help each other out. PICTURED: The villainous prankster, Mr Mxyzptlk, writer: (co-creator) Jerry Siegel, and artist: José Luis García-López all stand as firm favourites of Steve's in the life of Superman. IADW: It's a nice parallel, that for a website dedicated to the icon of a company renown for legacies, the Superman Homepage has one of it's own. With the tragic loss of founder Andrew Gould in 1996 to cancer, you inherited his creation, and the mantle of its Editor and Chief. How honoured were you to be chosen by Andrew to take over his virtual baby, and develop what he had started? Steve: Andrew was a great guy. While the website he started in 1994 and handed to me in 1996 was a very different beast to the Superman Homepage that exists now, there wouldn't be a Superman Homepage without the work he did. I still keep in contact with his mother, who is very proud that her son's work is being carried on in his name long after his passing. IADW: And 'carry on' Steve has, after adding to the content and range of what Andrew established, the Superman Homepage evolved into the official Superman section of the now defunct Fandom Inc megasite. Afterwards, Steve returned the Homepage to its independent roots, in a move which now sees it average 12,000 unique visitors daily, growing all the time in size and content. With that in mind, how does a guy keep track on the latest news and products involving a man whose 'faster than a speeding bullet' with regular human speed - especially when the characters shield alone has never met a coffee mug it didn't like? Steve: It's a full-time job. One I enjoy and thoroughly look forward to every day. It involves lots of searching and research, answering hundreds of emails, plenty of writing, editing and proof reading. It also helps to have a wonderful team of writers and helpers to write reviews and articles, email you news links, and generally keep you on your toes. IADW: With such a range of resources pooling into the various aspects of the super-site, is there a particular area of the Superman Homepage you are proudest of? Steve: The up-to-date news on the front page is obviously the main reason people come visit the website, so that's where most of my focus is each day. But the website as a whole has so many areas and aspects that are full of rich information, it's hard to pinpoint one section as a favorite. I love the fact that we cover everything, from the radio series, to TV shows, movies, comics, down to things like the wallpapers, image gallery, mobile phone accessories, food recipes, action figures and trading cards. 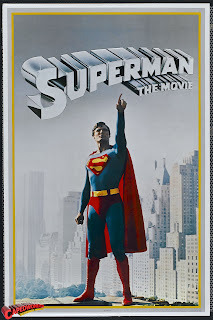 PICTURED: With the Radio Show 'Superman', Bud Collyer being Steve's pick for the best to bring the Man of Steel to life through voice, he turns to the iconic Christopher Reeve as his favourite 'live action' version, and this classic poster as the defining image of his hero. IADW: Such an extensive Superman website must lead to an extensive Superman collection - what is your most prized piece? Steve: Hard to pick just one. The key pieces would have to be the George Reeves cape swatch, Randy Bowen "Seinfeld" Superman statue, an issue of "Superman #12" (1941) and the George Award given to me at the 2008 Superman Celebration in Metropolis, Illinois. IADW: Metropolis to Smallville, the 1930's to today, the Superman Homepage showcases a variety of different takes on the stories of Kal-El, yet there is a sizeable chunk of the public who won't touch Superman because they feel they already know his story. Do you find that stability reassuring, or do you see Clark's 'never ending battle' as an ever-changing place? Steve: There are some givens in Superman's story that should always remain. His father sent him from the planet Krypton as a baby before the planet exploded. He came to Earth, grew up with the Kents as Clark, and took on the mantle of Superman using his amazing powers and abilities to help people. But just how that story is told is definitely up to interpretation and revision. Superman wouldn't have lasted so long if his story wasn't updated and revised over the years. The basic premise remains, but the stories and their relevance to each generation can change and adapt as need be. IADW: Okay, finally we all know Bats could never really take Superman, but could Superman out run The Flash? Steve: The Flash is the fastest man alive... You've gotta give him that. That we do! Thanks again to Steve for taking the time to do this interview, letting us find out about the man behind the website, and I'm sure we'll all be looking forward to seeing what the future holds for the Superman Homepage! This is a great idea for a feature, Dan--and I'm not just saying that because I'm part of it! Great interview! And--12,000 visitors daily? Color me jealous! Thanks Rob, glad you liked the interview! I'm looking forward to doing the others, then posting them here each Wednesday, as part of DC 75. With the wealth of fansites out there, I think it'll be fun to just spotlight the guys like yourself and Steve who drive them, and their love for the characters involved. Steve, was great to interview and his passion for the big 'S' really shows.